They say the fastest way to a man's heart is through his stomach. Which is a good thing, because the most sincere way I know how to say "I love you" is with a delicious, healthy meal. Add the strawberries and balsamic vinegar to a small saucepan. Heat the contents over medium heat until the strawberries begin to disintegrate, and the vinegar is slightly syrupy. Strain the mixture through a mesh strainer into a small jar and refrigerate until cold. 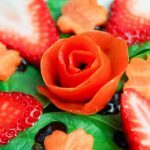 This beautiful fragrant low calorie dressing is perfect over your favorite combination of fruits and vegetables.